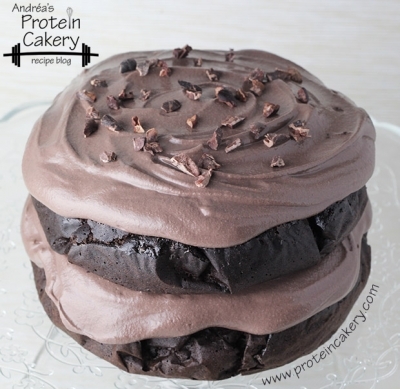 A moist and delicious high-protein devil's food cake! 1. Cashews must be soaked in filtered water for 4 hours or more. The drain and rinse cashews, and put in blender. 2. Add Â½ cup filtered water to blender, and blend cashews to a cream. If needed, add more water by the tablespoon (15ml). 3. Add 2 tablespoons cocoa, stevia, and 1/4 cup (1 scoop) whey powder. Blend until smooth. 4. Put frosting in the freezer to cool while you bake the cake. 5. Preheat oven to 325F (163C). 6. Line two 6" round (or similarly sized) pans with parchment paper (or use 1 pan, and bake them one at a time). 7. Mix all remaining ingredients until well combined. 8. Pour half the batter into each pan. 9. Bake for about 15 minutes, and see if the cakes are firm. Check every 1-2 minutes, and remove as soon as they are firm. Be sure not to over-bake these cakes! 10. As the cakes are baking, stir the frosting and set back in the freezer. 11. Let the cakes cool. 12. Spoon half the frosting on the bottom layer. 13. Set the top layer in place, and spoon remaining frosting on top. 14. Top with a few raw cacao nibs, if desired (not included in macros, but would hardly change them anyway). 16. Store in the refrigerator.